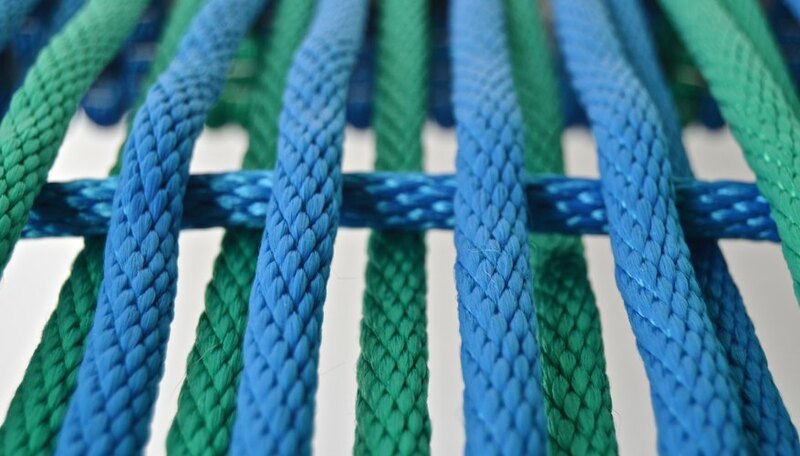 Transform an old coffee table into a fun and graphic bench by weaving a seat with colorful nylon rope. 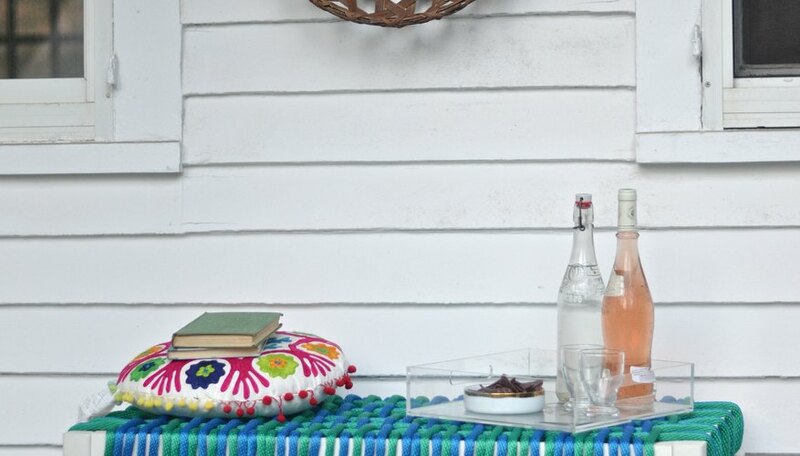 Save that old, scratched-up coffee table from the trash by transforming it into a modern woven seating bench. 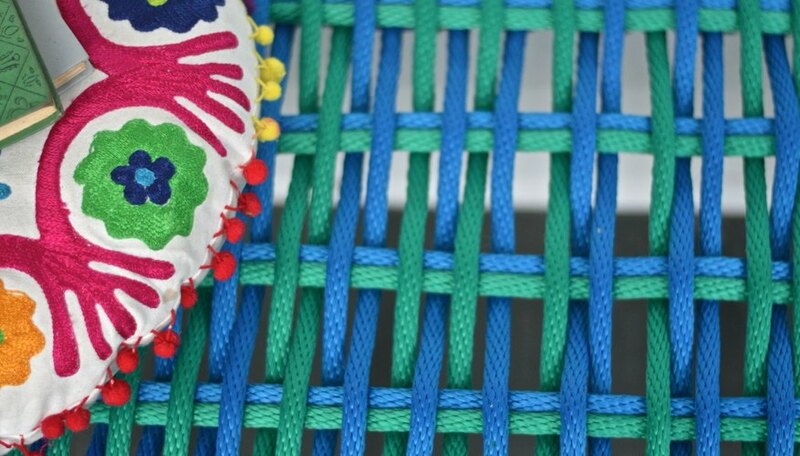 Using colorful nylon rope, this is a fun way to repurpose something that's past its prime into a Pin-worthy piece of furniture. Start with a wooden coffee table that has an apron and removable top. Flip over the coffee table and use your screwdriver to unscrew the top of the table. 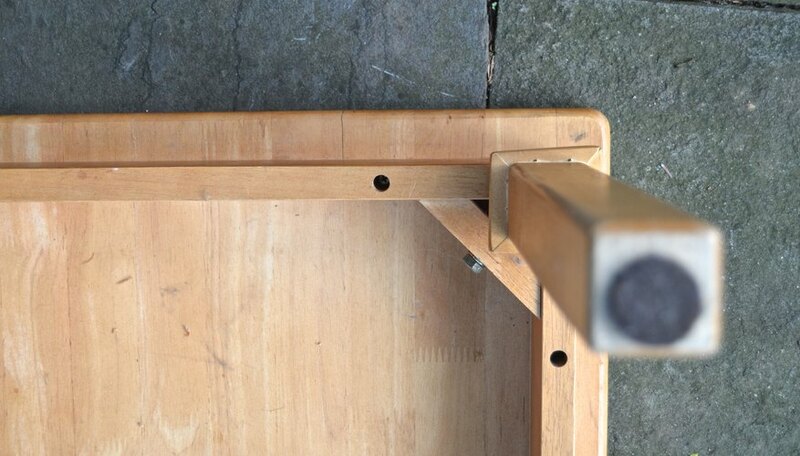 Look for holes underneath the table to indicate where the screws are. Time to paint. (This step is optional) Use a fine grit sandpaper to lightly go over the surface of the table to scuff up the shiny finish. For best results, apply a primer first. 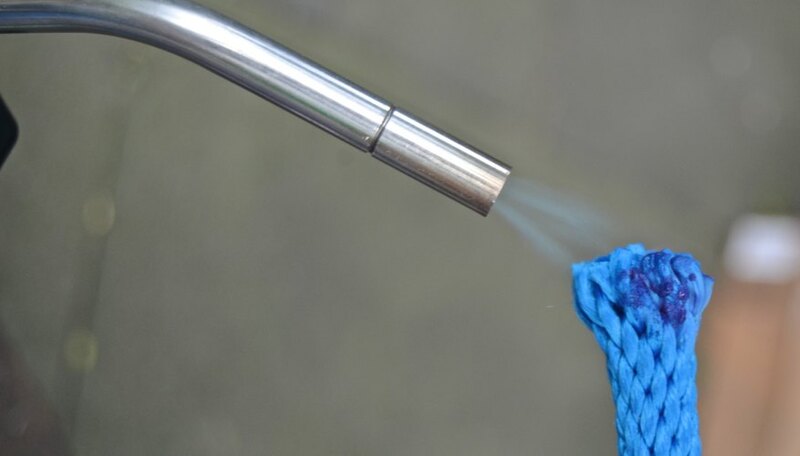 A spray primer is often the easiest method (a few light misty coats is best), but a latex primer applied with a paint brush will work just as well. Follow the directions on your primer label to determine when you can go over the piece with paint. Either spray paint or latex paint will work. Spray paint has limited color options, but can be much easier for a small piece like this. Latex paint can be mixed to any color you like, but will require a brush and some attention to detail around the corners and legs to prevent dripping. Measure and cut your rope. This table was 18 inches wide, and there are 5 pairs of ropes woven across the length of the bench. Each length of rope was approximately 32 inches long. 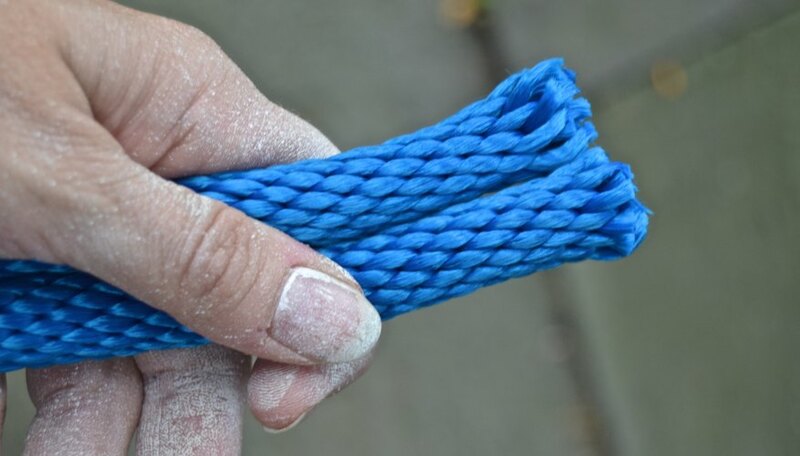 Depending on the type of rope you purchase, some will stretch more than others, but you can trim excess accordingly (see Step 7). Lightly burn the ends of the rope so that the nylon strands won't fray and pull apart. 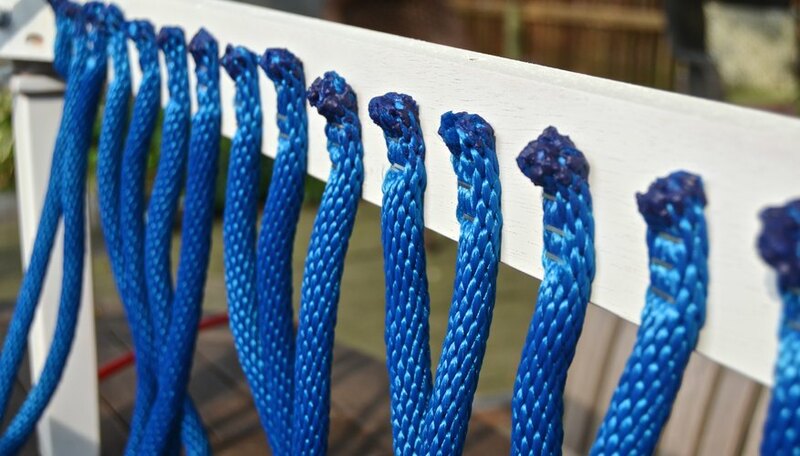 Start at one end of your bench, and attach the end of one length of rope using your staple gun. 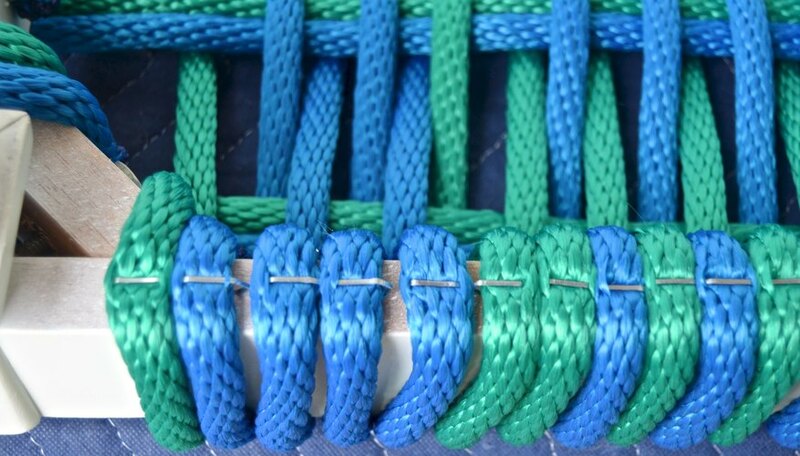 The second rope should be as close to the first rope as possible in order to achieve the same appearance as the bench pictured. 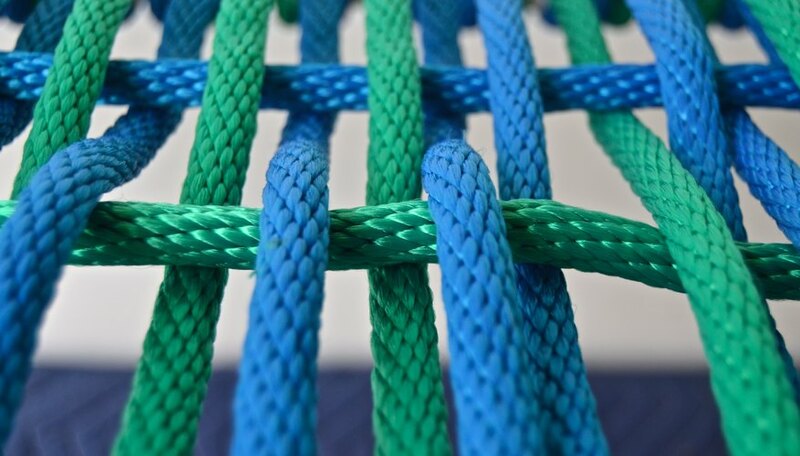 (If you space the rope further apart, the weave of the seat will be looser and therefore stretch out a bit more.) This bench has two different colors stapled in place freeform. Staple each length of rope three times to ensure strong attachment. Pull each rope as tightly as you can around the apron, over the top of the seat and then back around the opposite side. If necessary, trim the rope and melt the rope end. Secure with your staple gun on the underside of the opposite apron. Repeat for each rope across the long edge of the apron. Begin to weave the seat. 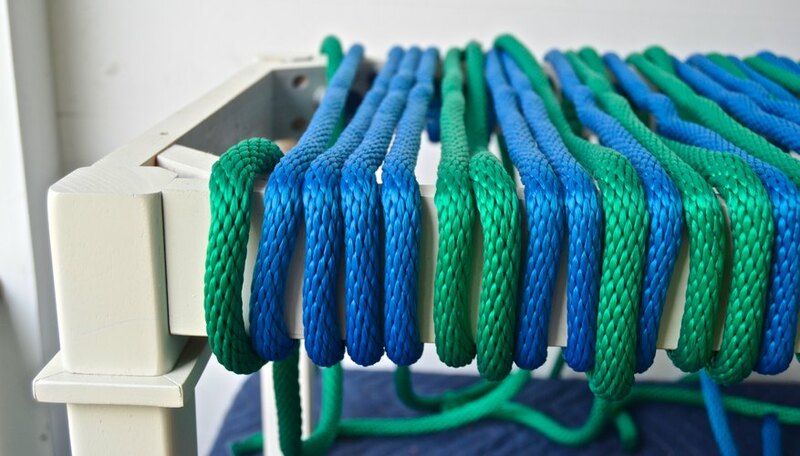 For the length of your bench, the rope lengths will be longer. This table was 38 inches long and each rope length was approximately 52 inches long. Repeat Steps 4 and 5 (cut and melt the rope ends). Staple two lengths of rope right next to each other on the underside of the end of the bench. Wrap around and over the apron (as in Step 7). One at a time, weave the rope over and under each of the stapled rope lengths. Pull tight, wrap around the opposite apron and attach as before with three staples. Repeat this step with the second length of rope (going over and under the _same_ rope) to create the pattern pictured. Fasten a second pair of ropes on the underside of the apron about 4 inches away from your first set. This time, alternate the weaving -- under and then over the ropes stapled across the width of the bench. (For example, alternate from the first length of rope.) Repeat this step with a remaining length of rope (going over and under the _same_ rope) to create the pattern pictured. Don't be afraid to play around with your weaving pattern. For example, consider going over and under two lengths of rope at a time for a different appearance. 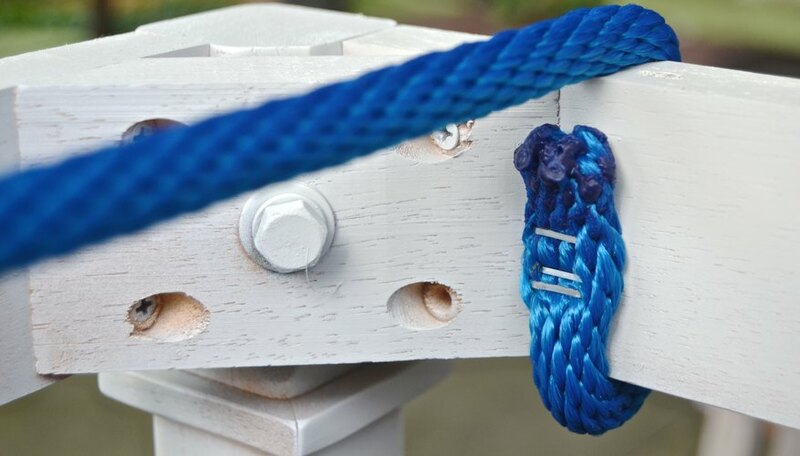 Flip your bench over and staple each rope along the underside of the apron for extra security. And you're done. 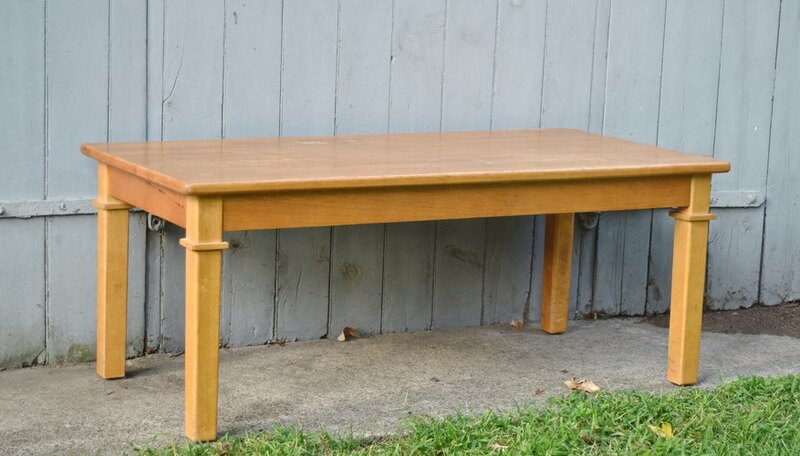 Display your beautiful new bench on your porch, in your garden or as an entryway addition.